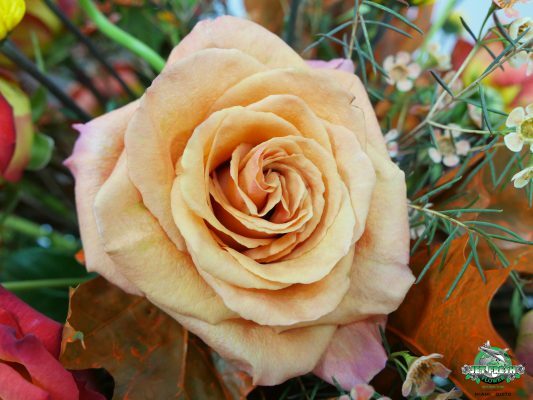 Last week on we announced our new Fall Mix Assorted Roses from our rose farm, Jet Fresh Flower Growers, S.A. One of our latest wholesale flower products for autumn, these assorted roses have the perfect warm tones to create unique arrangements this season. 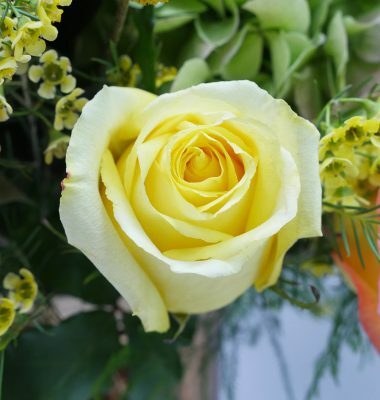 Using the same case of roses from our latest JFTV episode, our in-house floral designer, Olga Ramirez, AIFD, CFD designed two very unique #FreshInspiration fall flower bouquets using only fresh-cut flowers from the Cash and Carry at Jet Fresh Flower Distributors in Miami. The first bouquet Olga designed is a festive fall flower arrangement with orange focal flowers and yellow accent flowers. 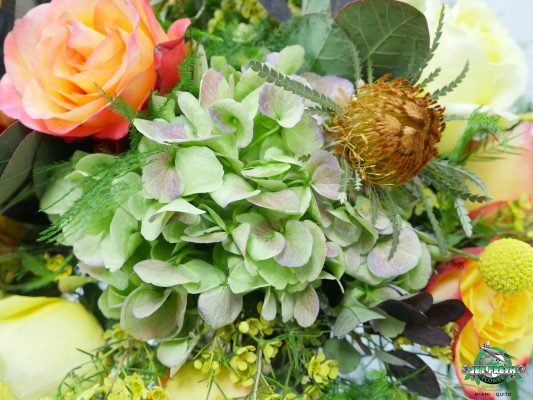 The second fall flower bouquet has a citrus palette mixed with green. Both of these bouquets perfectly demonstrate how wholesale Fall Mix Roses from Jet Fresh Flower Growers can be arranged very differently this season with so many possibilities. 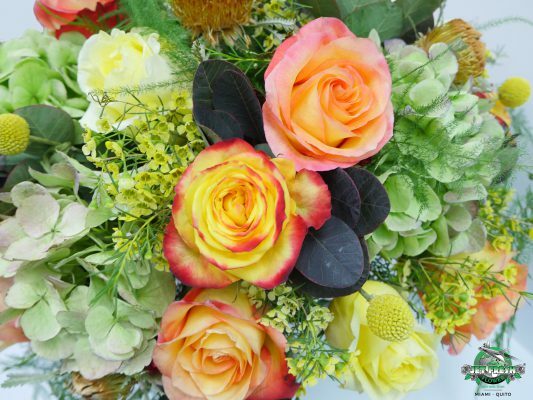 The roses selected for this fall-inspired bouquet are the varieties “Circus” and “Milva” from our Fall Mix Roses case. 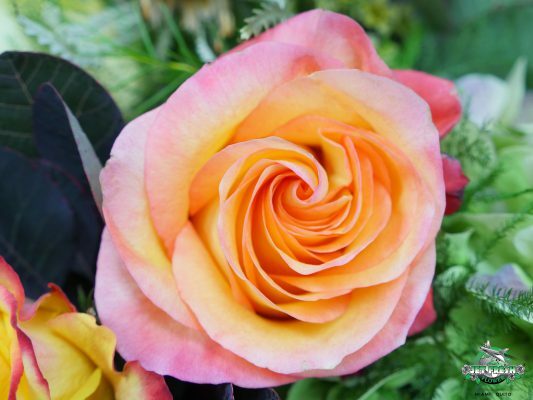 These two rose varieties have very different shades of orange which create depth without overpowering each other. “Circus” and “Milva” are available year-round from Jet Fresh Flower Growers and can be ordered directly from the farm as well as from Miami. 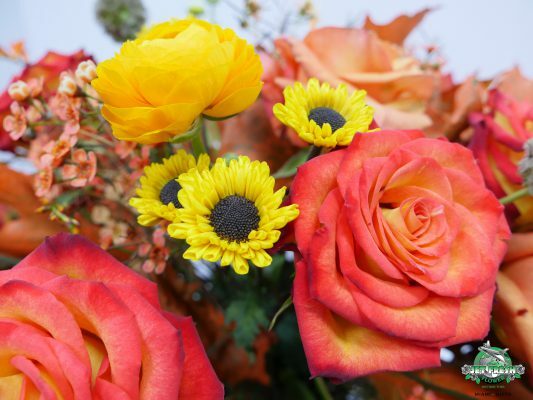 "Circus" from Jet Fresh Flower Growers, S.A.
"Milva" from Jet Fresh Flower Growers, S.A.
Olga does a wonderful job incorporating fall elements which contribute to the bouquet’s playful elegance. 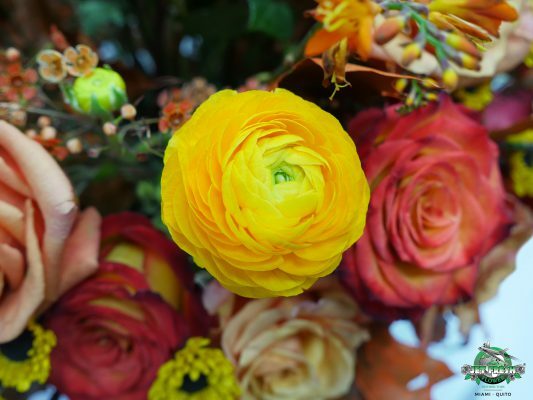 Yellow Ranunculus are a natural standout in this sea of orange, along with bright yellow “Viking” poms which quickly grab your attention. Additional fall flowers in this bouquet include orange Wax, Scabiosa Pods, Dutch orange “Emily Mckenzie” Crocosmia, and orange Oak Leaves. All of these flowers and more are available in different colors for fall from Jet Fresh Flower Distributors in Miami. 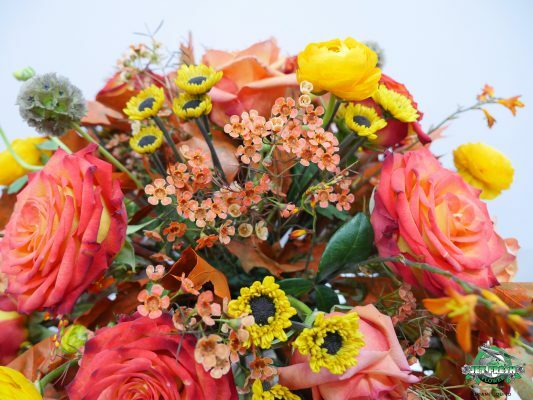 Olga Ramirez, AIFD, CFD designed her second fall mix bouquet with a very different color scheme. 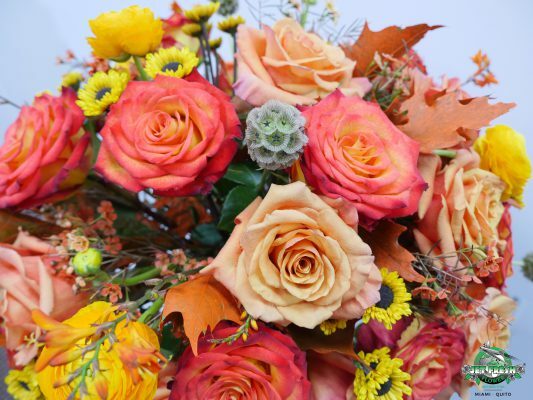 Still using the Fall Mix Roses from Jet Fresh Flower Growers, S.A., she created a colorful citrus-inspired bouquet that’s perfect for autumn in Miami. 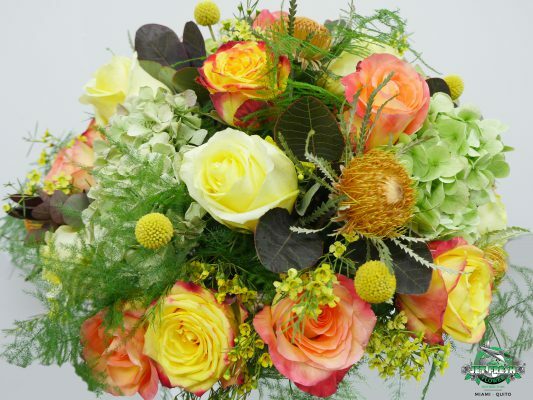 The roses in this bouquet are much more vibrant and beautifully capture the citrus color palette. They have a strong yellow presence joined by beautiful bi-colors that give us more colors to enjoy. Each of these roses are available year-round and can be ordered directly from the farm or from Jet Fresh Flower Distributors in Miami. "Tutti Frutti" by Jet Fresh Flower Growers, S.A.
"Encanto" by Jet Fresh Flower Growers, S.A. 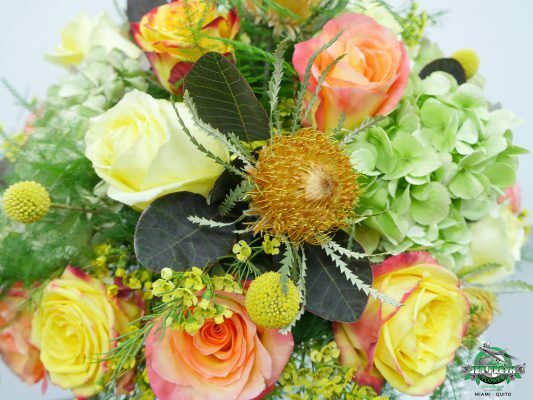 This bouquet would not have a citrus theme without green in it. Olga cleverly incorporated Antique Green Hydrangea to give this bouquet a strong green presence that’s soft and complementary to the yellow and orange roses. As a protea-lover, my eyes quickly gravitated towards the Banksia Dryandra Formosa Protea. The size and texture makes this bouquet look even more grand with its soft foliage and dark yellow center. Olga included yellow wax as well as craspedia as the filler flowers for this fall citrus bouquet. They helped soften the green from the Antique Green hydrangea while bringing out the yellow roses, respectively. This arrangement wouldn’t be complete without the final greenery touches. Plumosa Fern, also known as Asparagus Fern, are spread throughout the bouquet with isolated areas of Cotinus, or smoke bush; which have a lovely variation of green and burgundy foliage leaves that are simply perfect for fall. Our Fall Mix Roses from Jet Fresh Flower Distributors include the rose varieties featured here today. 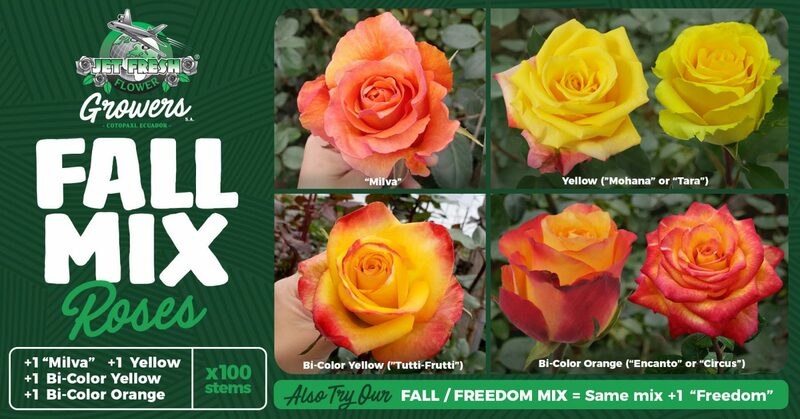 The Fall/Freedom Mix also includes the same Fall Mix Roses, as well as a bunch of red “Freedom” roses. Contact us today to learn more: Sales@JetFreshFlowers.com. 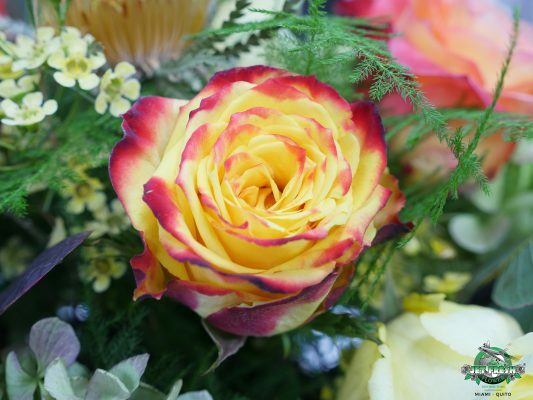 This entry was posted in #FreshInspiration, Jet Fresh Flower Growers, News and tagged fall, fall mix roses, Jet Fresh, Jet Fresh Flower Growers, jftv, melisaworldwide, Roses.